For everyone that has enjoyed a tandem flight with us, learned to fly under our instructors, there is one thing we hear consistently: "You have the best job in the world." We don't take this comment lightly, and even after hearing it a thousand times it is a nice reminder of how privileged we are to be able to make our passion our profession. It speaks a lot for our team for this passion to still remain after all these years. In fact, it grows with almost every flight. Nothing compares to the feeling of soaring freely with the birds over one of the most picturesque landscapes on earth, and with each joyful shout from a passenger that leaves the ground for the first time, or a student that has made their first successful landing, our passion is recharged. We are the first paragliding company in Nepal, and with over 18 years of experience our knowledge of the local flying conditions is unmatched. Paragliding, like everything in life, is constantly evolving, and we are committed to guiding the growth of it here in Nepal in the most professional, safe, and enjoyable way possible. We take our title as "The Paragliding Pioneers of Nepal" very seriously, and are constantly searching for new flying routes, sites, and ways to improve to ensure the adventuresome spirit that gave birth to this sport is alive and well for years to come. If you have dreamed of flying, let us help you make your dream come true. 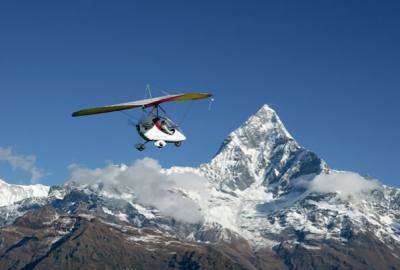 Shuttles from your hotel in Pokhara only from Lake side area. We pride ourselves on our safety record while still offering cutting edge adventures.